Yes we cook, we get people involved, we help them with their knife skills and teach them how to be the “best chef” they can be, but is this really what we are selling to companies that do cooking events with VictorsFood? I think not! 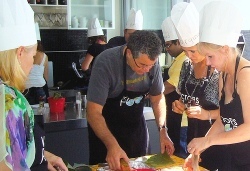 From my 12 years experience doing Interactive Cooking Team building events one thing always stands out – we are building relationships. The cooking activity is just the medium that makes it all happen. When using our services do companies really think about this? The smart ones do. 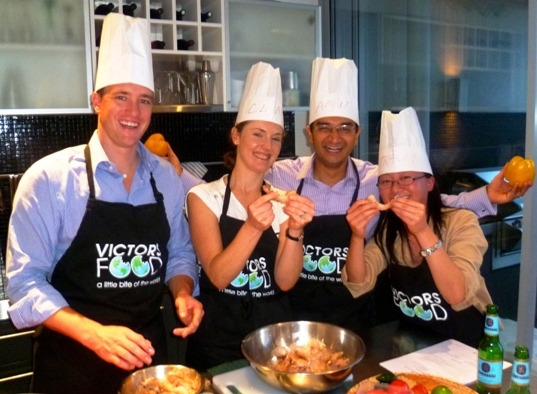 But I think many miss the point when they are looking around for “corporate cooking classes,” they are thinking of it as a “fun” time with their team (which it is), but this is so much more than a trip to the pub for a feed and some drinks. Our best clients use it for the bonding element to create better working relations and better teams. What I have noticed is the companies that do “get it” provide useful information to use about their team and mission so we can facilitate the many facets of human bonding within a cooking environment. These are the companies that are going places. 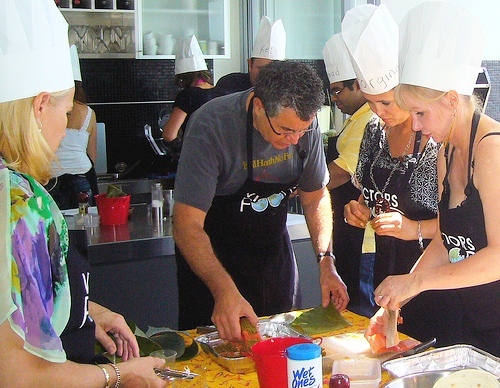 Don’t get me wrong – we are happy to do a Cooking Party or even a Cooking Class for any group, but for actual results in team building, don’t confuse these options. For example when I get the groups sometimes to peel prawns with me I gather about 3-4 people together and show them how to do one, then I start asking them questions about their work, their lives at home and what they love in their lives. As they reveal bits of themselves to their colleagues, the conversations really flow and they pick up on this and run with it. So the next time they are at the water cooler or conference table at work, they build on these relationships to form a bigger bond which leads to business wins. It’s a wonderful thing to see and be part of. So can cooking build relationships? Absolutely it almost happens automatically, but you need to have the right “tools” in place (e.g. structure, recipes, atmosphere, Chef Presenters, etc) to get people really bonding, talking and interacting on a primal level of doing something together that is important in their lives – “eating”!